Flexible Rate without restrictions with free wellness path in our Spa Vignavecchia, just to 50 meters outside our hotel. During your stay at the Palace San Niccolò you will have the opportunity to access the services of the Wellness Center of Palazzo Leopoldo. 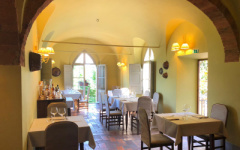 The Hotel San Niccolò, in the centre of Radda in Chianti is on of the few 4-star hotels in Chianti hosted in an ancient palatial residence with modern furnishings and the highest levels of comfort. It is the ideal choice for all those who want to stay in the heart of the Chianti area in a hotel that blends tradition and modernity. Radda in Chianti hotels can offer a wide range of accommodation, but at the Hotel San Niccolò you will find elegant rooms furnished in the typical style of the area; they are very bright and anyone staying in them will delight in their warmth and tranquility. The Hotel Palazzo San Niccolò is also the perfect choice for business guests who need to find, among 4-star hotels in Chianti, where take advantage of modern facilities to organize seminars, courses, meetings and every kind of event blending the best of modern technology and striking internal design. Thanks to the very central location among Radda in Chianti hotels, the 4-star hotel Palazzo San Niccolò allows guests to explore the many attractions in the Chianti area by booking organized tours, and also to discover some of the most beautiful cities in the Tuscan region.